Hello guys, Stevie is back with a long over due blog post. I first intended to post this on mid Oct but apparently my October was pretty busy and I got no extra time to update my blog ( or at least for this post) as I have other deadlines too:'(. I'm trying my best to post regularly but I'm still getting used to it, so I hope you guys don't mind. 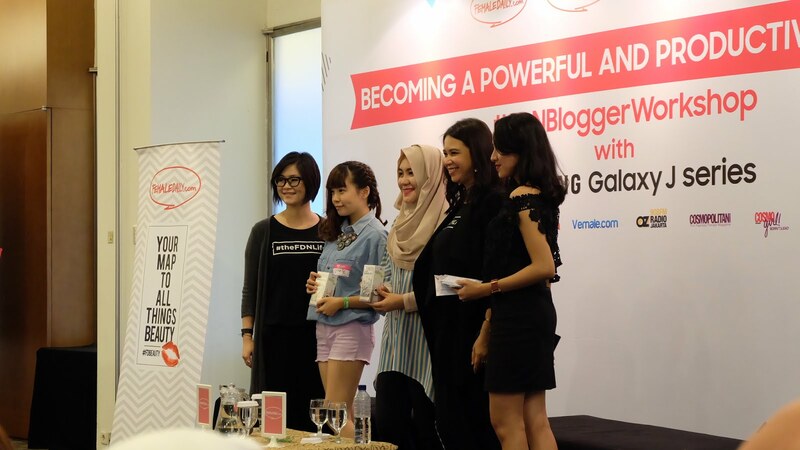 Well let's begin, on 8 Oct 2016 I attended Blogger Workshop held by Female Daily. Although I love writing and photography but I'm still new in this whole blogging world. So I decided to join this workshop to gain more insights about blogging from those figures who've already done blogging for years. Being in public and meeting new people can be a little energy draining for me because I've always been an introvert so going to this kind of event is like breaking down walls and going out of my comfort zone, but I think networking is important and meeting new people can be very exciting too because without noticing you can actually learn a lot from different people's experience and perspective opening your ways to see things differently too! It also enriches your personality and character as an individual, because living is a journey of endless learning right? During the event not only bloggers came but emerging Indonesian Youtuber also came to share their tips or two about vlogging and Youtube. The first talkshow session was shared by Harumi Sudrajat and Cindy Karmoko about "The Power Blogger" I could really say the things they shared have gave me many insights regarding blogging which aren't available anywhere online because they shared from their perspective and experience which can really get to me because it was relatable. Second session was filled with lots of laugthers and jokes by the guest speakers Suhay Salim, Jovi Adhiguna, Cheryl Raissa, they shared about vlogging and their journey creating YouTube videos. Those 3-10 minutes videos that you enjoy watching took so much hard work and effort to create. They also said that the key factor is to just start making content and all the other probs and add ons such as cameras, lighting , etc will come and improve in addition to your work. So they've highlighted that you don't need to start off with the best camera and everything but the most important part is to have the willingness to create. Jovi Adhiguna even said that many vlogger these days even use their handphones to vlog and the results are pretty good too, especially if you're already a smartphone user. Cause these days smartphone comes with camera that are already very good and produces good quality images. Fourth talkshow session is about "micro blogging and building your online presence" It was shared by Astrid Satwika and Rahne Putri. They shared the importance to share their honest thoughts on their social media platform and share their positive thoughts too in order to be able to inspire people through their stories and experience. In between sessions we got lunch and tea breaks where we could enjoy the food and refreshments while we can also take pictures and mingle with friends, I'm very grateful that I know a few faces Gina and Mei. So I dont end up feeling completely awkward. Throughout the day there was a social media competition so each participant was requested to update their social medias ( Instagram), and they could get a chance to win the new Samsung Galaxy J5. I posted some picts even though I never had the slightest thought that I could have won. hahhahaha But I'm proud to say I'm not lucky but I'm blessed! I believe everything that has happened is not by chance but it has been very well planned by my Heavenly Daddy! For normal eyes and even in my eyes at that particular moment it felt surreal and I think that I'm just being lucky but after reflecting I come to the point that nothing is ever by hence everything is being well planned by Him, Our God! So right after the last segment we're all moved to our designated class, I signed up for the writing class with Laila Ahmad who is also a blogger and a content writer for a particular sister company of Female Daily. I chose this workshop because I consider myself still very new in this whole blogging thing and I want to gain more knowledge on how to be a better writer and how to be more engaging with my readers. Overall it was a very fun event ! I gained a lot of knowledge, made new friends and become more confident in what I believe in.